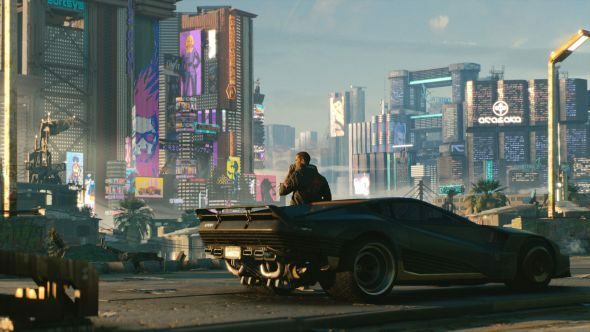 We now know exactly which Night City districts will appear in CD Projekt Red’s Cyberpunk 2077. Information handed out to press following a hands-off demo at E3 confirms where you’ll be able to visit when you eventually get your hands on the game. Cyberpunk 2077 takes place in the futuristic dystopia of Night City, set in the state of North California in the year, you guessed it, 2077. The Cyberpunk board game divides the city up into ten large ‘zones’, most of which are sub-divided into smaller zones. Six of those appear to feature in the new game, re-imagined as districts. Cyberpunk 2077 could very easily claim a place on our list of the best RPGs. The biggest of those districts is the City Centre, dominated by corporations and “the quintessence of luxury.” There’s also Watson, a district dominated by Asian cultures that was once a fellow corporate giants but is “now populated by immigrants, hiding various bazaars and markets in a tangle of narrow alleyways.” Another district, Westbrook is a playground for Cyberpunk’s wealthy. At the other end of the financial spectrum are Night City’s poorer or more crime-ridden districts. Heywood is a little plush, but it hides an underlying gang problem. Pacifica is just dangerous, being a largely abandoned district overrun by gang activity. Finally, the district of Santo Domingo is the city’s industrial powerhouse, filled with power plants and factories. We don’t know the Cyberpunk 2077 release date, but hopefully we’ll learn more soon – CDPR says that now it has officially revealed the game, it’ll be more open about it in the coming weeks.